Bellatrix, γ Orionis, Amazon Star, warrioress, 24 Ori, Al Najid, HR 1790, BD +06°919, HD 35468, SAO 112740, FK5 201, HIP 25336. 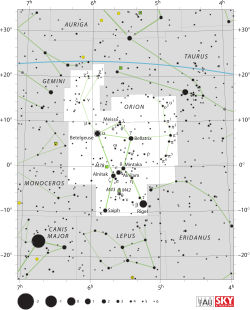 Bellatrix, an aa kent bi its Bayer designation Gamma Orionis (γ Ori, γ Orionis), is the third brichtest starn in the constellation Orion, 5° richt o the reid giant α Ori (Betelgeuse). ↑ 1.0 1.1 1.2 1.3 1.4 van Leeuwen, F. (November 2007). "Validation of the new Hipparcos reduction". Astronomy and Astrophysics. 474 (2): 653–664. arXiv:0708.1752  . Bibcode:2007A&A...474..653V. doi:10.1051/0004-6361:20078357. This page wis last eeditit on 26 Februar 2015, at 17:30.